Size of this preview: 774 × 600 pixels. Other resolutions: 310 × 240 pixels | 800 × 620 pixels. Specimen of Craigleith sandstone, Craigleith Quarry, Edinburgh, Lothian Region. Sample of Craigleith Sandstone from the building stone collection of the Edinburgh World Heritage Trust. 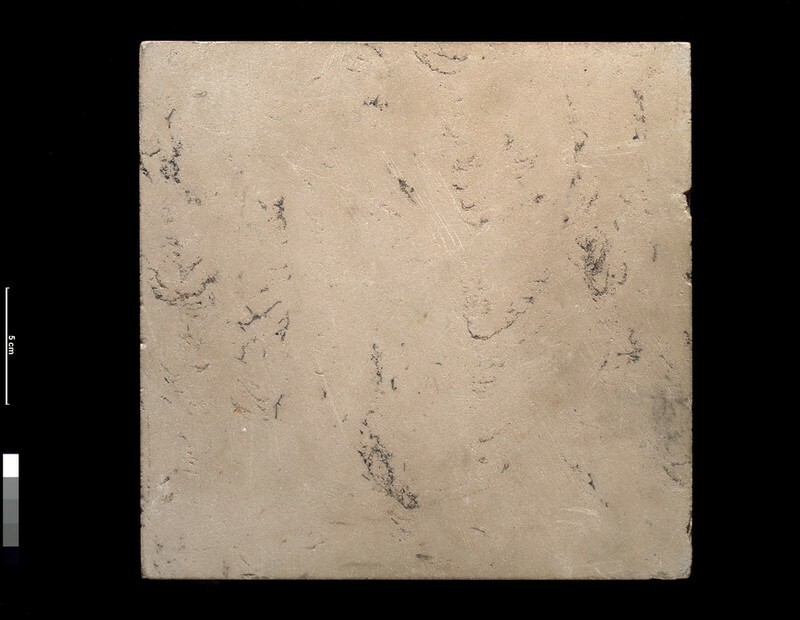 The stone has a cut surface with a very pale buff colour with variable dark whispy markings. This specimen is of Carboniferous age. Edinburgh World Heritage Trust sample no. EWHT 19. This specimen is of the best quality 'Liver rock' from Craigleith Quarry, which gained a world-wide reputation as a durable building stone. It was used for the fronts of the best houses and public buildings because it could be given a very smooth surface ('polished ashlar') and was also suitable for decorative moulding work. Apart from being used in Edinburgh, Craigleith stone was exported to London, Europe and the USA. The images featured on this site unless otherwise indicated are copyright material of the Natural Environment Research Council (NERC), of which the British Geological Survey is a component body. The British Geological Survey encourages the use of its material in promoting geological and environmental sciences. The images may be reproduced free of charge for any non-commercial use in any format or medium provided they are reproduced accurately and not used in a misleading or derogatory context. Where any images on this site are being republished or copied to others, the source of the material must be identified and the copyright status acknowledged. The permission to reproduce NERC protected material does not extend to any images on this site which are identified as being the copyright of a third party. Authorisation to reproduce such material must be obtained from the copyright holders concerned. This page was last modified on 11 April 2015, at 22:13.